Today in school we played dodgeball. Or, rather, I played dodgeball, and everyone else played kickball. But then they were all "NOO COME ON YOU CAN'T BE THAT BAD" and I was like "HAHAH THAT'S WHAT YOU THINK" and then they made me kick it and I ran to the wrong base. Actually, I didn't even run to a base, I just ran to this random mat that I thought was a base, but was just IN THE WAY, and POINTLESS, kind of like the interpretive dancing at the Oscars. But you know what would've made this experiment far less painful? IF I HAD BEEN WEARING THIS: Along with paying a visit to the 60's (my favorite era, which is probably some kind of twist of FATE) (see what I did there? Bob Dylan song? 60's?) (Oh wait, that song is actually 70's. I...fail. Anyway.) Miu Miu was almost cartoonish with its giant bows, poppy colors, scallops, exaggerated pocket piping, and shoe skirts that added an extra clunky stomping factor to the overall effect. And there were LOTS of embellishments with metallic bows and flowers, kind of as if the wearer was a little girl going through her grandma's jewelry box (from when grand mam mam had her 60's heydey) and sort of decorating herself with brooches. 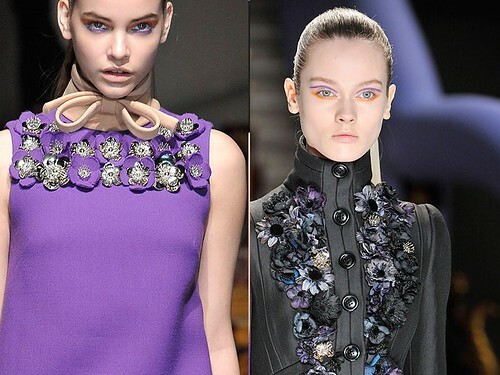 It started out with the bright colors and cartoon-ish lace (which I will now refer to as the little sister of Prada's) but towards the end got to a place that was darker, a different kind of romantic, slightly stark.. The silhouettes, colors, and fabrics became more sophisticated, and the playful, wiry flower brooches were replaced by some in full bloom. The spring collection will always be my favorite, and that kind of magic can't happen twice. But over all, it was cute and fun and Miu Miu. And it still would've made that really awful game of kickball much, much better.